PROVINCIAL CURIA, Quezon City – To fulfill the important project of intensifying communion with the Order by “favouring the learning of Spanish,” the Province of St. Ezekiel Moreno sent Fray Reynaldo Jaranilla, OAR to Colombia for a yearlong exposure at UniAgustiniana (or Universitaria Agustiniana) in the capital city of Bogotá. 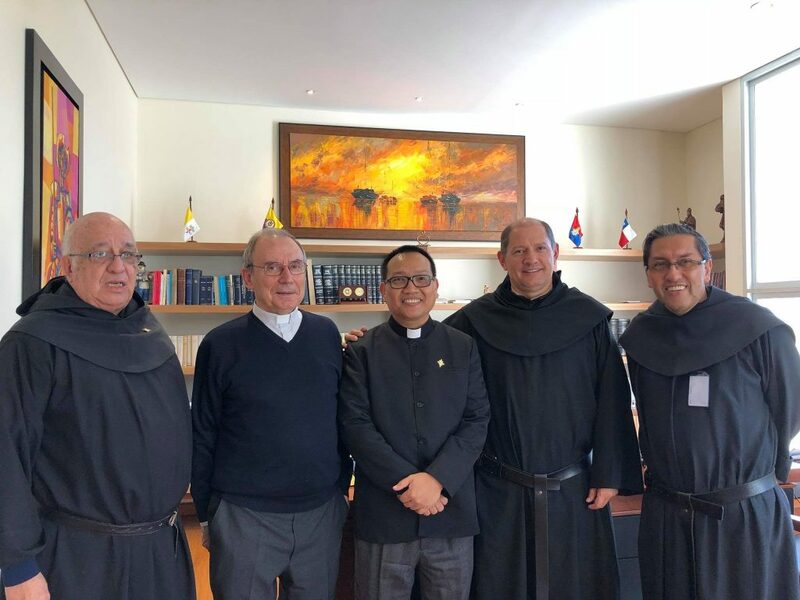 The recent General Chapter of the Order of Augustinian Recollects (OAR) determined that within the sexennium (2016-2022), this fourth and youngest Province of the Order must act on the decision that encourages its younger friars to learn Spanish, so far the widely spoken language in 20 countries where the OAR is present. Having felt the need to equip himself with the facility to express in Spanish, Fray Jaranilla volunteered to work in a Spanish-speaking community. The Provincial Council, having deliberated on the necessity not just of complying with the Life and Mission Project (LAMP) but also of boosting the communications apostolate with its needed “implements” such as learning the official languages of the Order, unanimously approved the petition. Fray Jaranilla chairs the Recoletos Communications Inc. (RCI) which is the technical and business arm of the Commission on Communications and Publications-Recoletos (CCP-R). He was among the friars behind the “technical” success of the 2006 Mission Congress held in Manila, the documentation team under the aegis of CBCP (Catholic Bishops’ Conference of the Philippines) for the 51st IEC (International Eucharistic Congress) held in Cebu last 2016, and the secretarial works during the recently-convoked 7th Provincial Chapter of the Province, to name a few. “In some cases I can also continue to help. Just let me know. I’m just one click away,” Fray Jaranilla assured the Commission during one of its Execom meetings. But even before the triennium 2015-2018 ended, Father Selma had already relayed to the entire Province the need for volunteers to work in Colombia. At least two friars responded with willingness and signified to him their intention to work there as part of the interprovincial collaboration and to learn Spanish at the same time. By the time, however, the decision to pull those volunteers out from their respective assignment was almost finalized, the Provincial Chapter was already in the offing. The Council took the prudent way to just wait until after the transition to the new administration will have arrived, most especially because those volunteers were then handling key roles in their area of apostolate. With the shift to a quadrennial administration, priorities were set according to the newly-approved Life and Mission Project of the Province. All the religious were assigned to communities and offices in response to those priority projects partly dictated by the “ordinances” of the recent General and Provincial Chapters. With this as background and considering the provisions for interprovincial collaboration and communion through learning of Spanish, the Provincial Council singled out Fray Jaranilla from among those volunteers who were already appointed to their area of expertise, and directed him to prepare for Colombia. “Colombia” rings a bell to those who know well the biography of St. Ezekiel Moreno, and much more to any Augustinian Recollect! This year, in fact, marks the 130th anniversary (1888-2018) of then Father Ezekiel Moreno et al.’s “missionary expedition” to this Latin American country “to restore the Province of Our Lady of Candelaria.” Fray Ezekiel and his group left Spain on November 28, a significant day for this fourth Province of the Order, being its foundation day almost 20 years ago (1998-2018). It also rings a bell because it was here where Fray Euben Capacillo, OAR and Fray Jesus Pastor Paloma, OAR lived and worked. They were the first two Filipinos to have been assigned in Colombia. The former arrived here in the 80s and is presently a member of the Vicariate of the USA which is under the Province of St. Nicholas of Tolentine. The latter lived and worked in Bogotá for more than a year. He was appointed Parochial Vicar of the St. Joaquin Parish in Santafé, located in this high-altitude Andean city, from March 10, 1995 until his sudden death due to heart attack at Santuario del Señor de Monserrate, also in Santafé, on November 9, 1996. Following the customary protocols, the major superior of the St. Ezekiel Province sent communications to Fray Albeiro Arenas, OAR, the (re-)elected Prior Provincial of the “new” Province of Our Lady of Candelaria to which Colombia belongs. The Prior General, Fray Miró, was also formally informed, although he had earlier known this decision and expressed pleasure on its implementation. Fray Jaranilla arrived in Bogotá on July 20, 2018 when the Candelaria Province was halfway through its ongoing Provincial Chapter held in Ráquira, some five-hour drive from the capital. Fray Carlos Alberto, together with a lady school official who also speaks English, welcomed him at the airport. And since Day 1 of his residence at Casona Tagaste in Fontibon, a district in the west of Bogotá, Fray Jaranilla’s experiences of the Augustinian Recollection have expectedly widened. “In fairness sa ilaha (to them), they are doing a good job sa (in the) schools,” he conveyed to this writer via Messenger. There are seven OAR schools in Colombia. The four (4) are in Bogotá (the Uniagustiniana in Fontibon, with its two campuses: Agustiniano-Tagaste, a basic education institution and considered juridically autonomous from the university, and Agustiniano-Suba which, by contrast, is attached to the university; Agustiniano-Salitre which is located downtown; and Agustiniano-Norte which is the nearest to the Provincial Curia). The other three are outside the capital: Agustiniano-Floridablanca in Bucaramanga, Agustiniano-San Nicolas in Medellín, and Agustiniano-Campestre in Palmira. Just as “Agustiniano” is consistently used as part of school branding and for which the OAR friars (or Agustinos) are better known in Latin America, so too “Recoletos” is appended in OAR schools in the Philippines and for which the Filipino OAR are better known. A national heritage and over a century old, the convent in Fontibon where he is staying now will be his home for the whole duration of his exposure in Colombia. It is located within the premises of the university. He also clarified that for this semester, “I am only assisting CCNA 1 to 4.” CCNA stands for Cisco Certified Network Associate while Cisco refers to the brand company for high-technology services and products, and specializes on tech markets such as domain security, among others. Since his Cisco Career certification has expired already, Uniagustiniana—he was told—commits to help him secure his re-certification. While the language may stand as an interim barrier, Fray Boyax, as his confreres call him, has the X factor to surmount it.